DETROIT – Saturday was hot. Blistering hot with strong winds. All week weather reports recommended Michiganders plan their weekend with caution for impending thunderstorms – maybe a severe thunderstorm they said. Despite intense winds there were only a few clouds. It never rained. 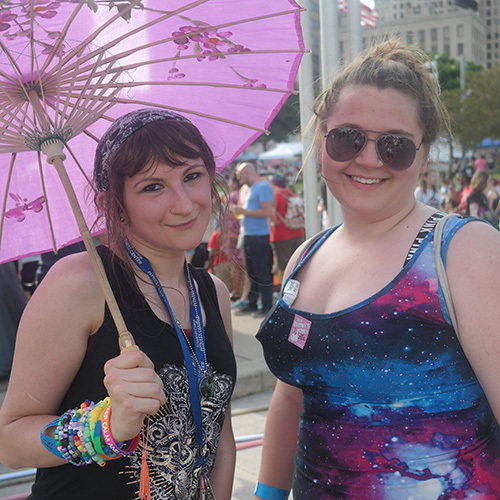 Motor City Pride took over Hart Plaza and as thousands flocked to downtown this weekend to celebrate Pride events and happenings spread throughout the city. 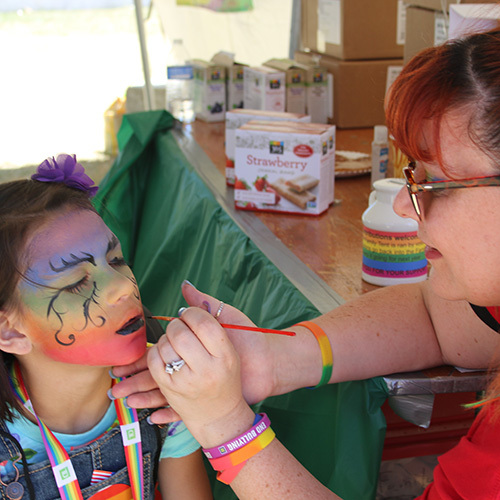 The festival itself hosted an array of activities from a kids area that included face painting, arts and crafts, visits by Dr. Dino and more to an array of performances that were spread out over four above ground stages and one underground dance floor. 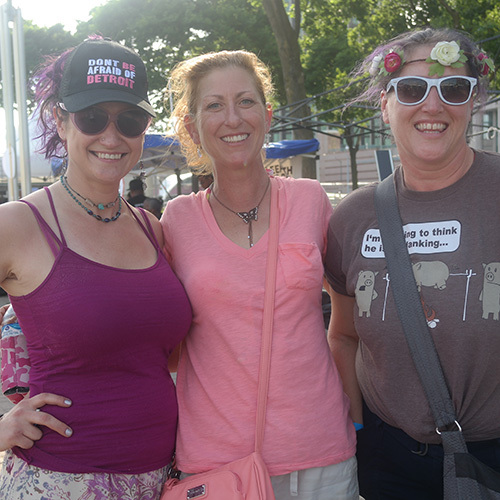 The festival smelled like sunscreen and plastic pride beads. 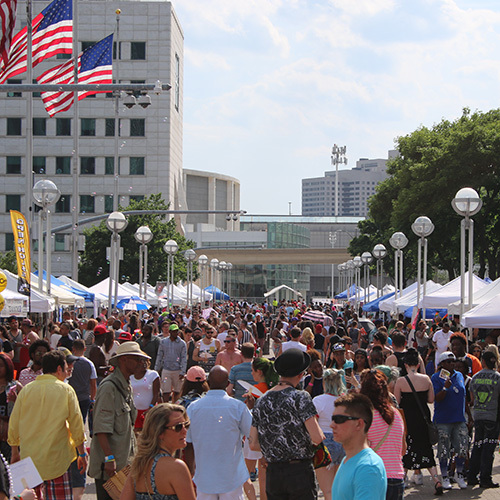 Over 100 vendors attended this year’s Motor City Pride including the Michigan State University Student OMM Clinic of Detroit, NOCIRC of Michigan, the Detroit Police Department and the U.S. Equal Employment Opportunity Commission. 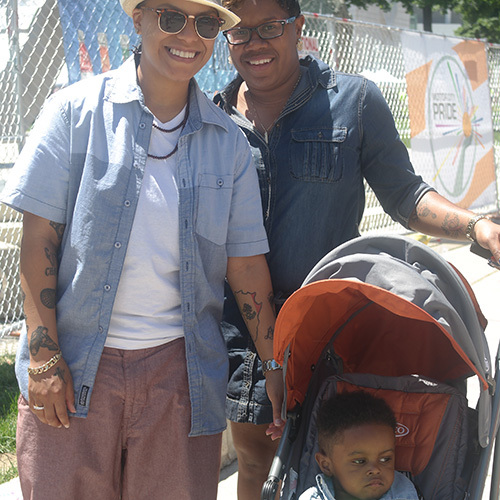 Lorina Nichols and Ebony Lowe brought their son Devon. They were married October 3 and say that married life is not much different than life before the certificate. 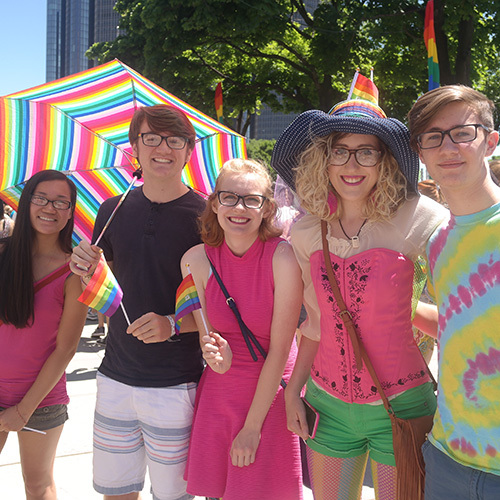 Over the course of the past eight years they’ve come out to Motor City Pride twice but this is the first year they’ve been able to come with Devon. “This is something new for him to see,” Nichols told BTL. “Its nice to be around people like us and be around our family, basically. It’s important for us now that we have a baby that he gets to see other kids like him, who have two moms and two dads,” Nichols said. “Amongst the celebration I wanted to bring in the conversation about how much work we still have to do. I wanted people around the world to know that we here in Detroit stand with our fellow humans in this time of tragedy and we aren’t going to stop being ourselves. We can celebrate and we can mourn at the same time,” Kubat explained. She heard about the shootings first thing in the morning and immediately started following the incident. The story changed as updated reports flooded the media sphere raising the body count from 20 to 50 and then finally declaring it a massive hate crime targeted against the LGBT community. “There were a lot of times where I placed the sign over my face to distance myself and take away the idea that I’m claiming it or that I’m responsible for the sentiment. 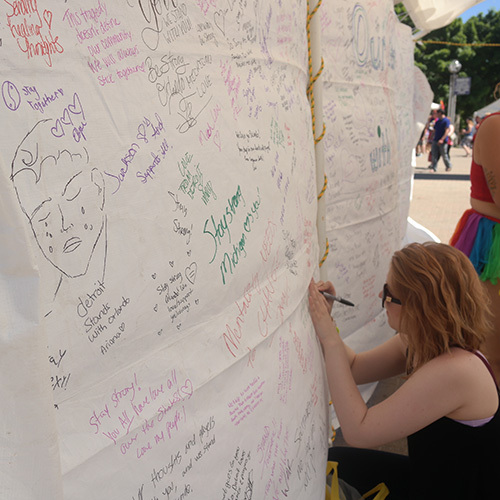 I didn’t want to feel like I was capitalizing on it in anyway, it was unlike any other Pride fest that I’ve been in because people were reacting to the sign with such depth. 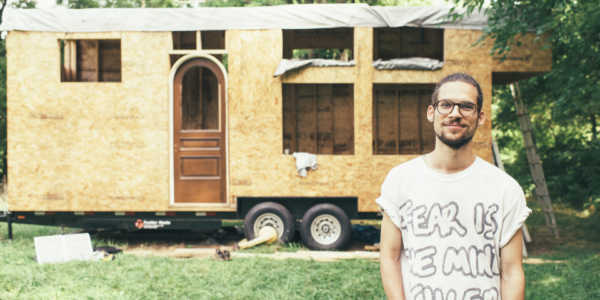 And I realized how important it was to come out and be visible,” Kubat said. William VanHemert, chief executive officer of Unified – HIV Health and Beyond, attended the Sunday parade with his partner Robert. 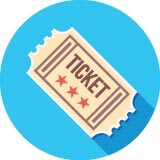 The two of them, clad in plaid shirts and big sunglasses, clapped in unison when Kubat walked down Jefferson to the Pride festival gate. “Gay Pride happens once a year in June. 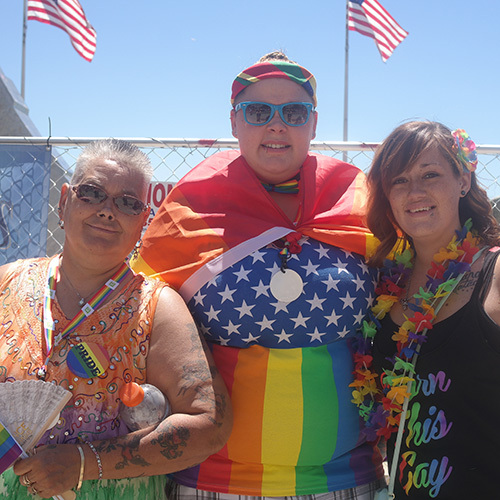 We came out to support our community and today, Sunday, after what happened in Orlando we felt it was more appropriate to come down here and support our community and be in camaraderie with our brothers and sisters,” VanHemert said. 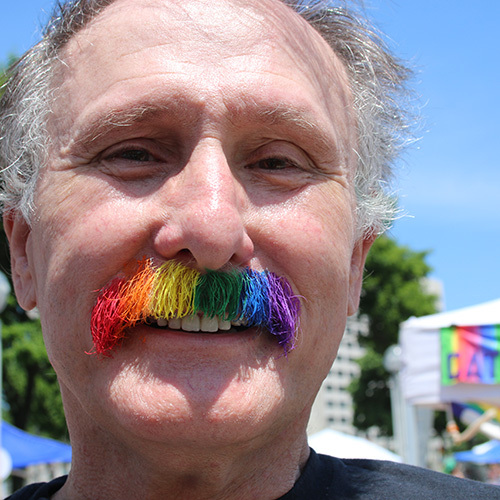 This year was VanHemert’s first year attending the Pride Parade. Since moving back to Detroit from San Francisco, he’s always attended the festival but had never caught the parade. 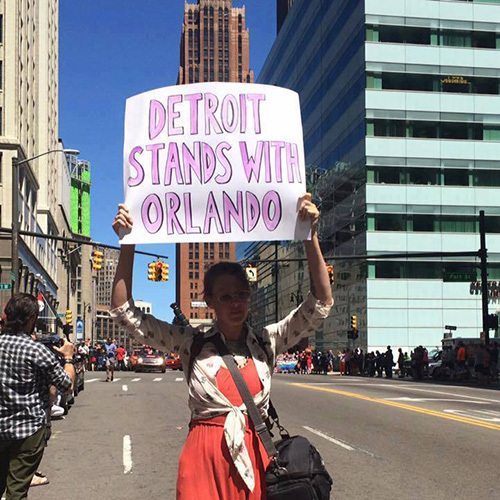 The LGBT community in Detroit was visible. Orlando Florida sits more than 1,100 miles away from the Motor City but the victims and the tragedy were not not far from anyone’s mind during Michigan’s largest LGBT Pride festival. 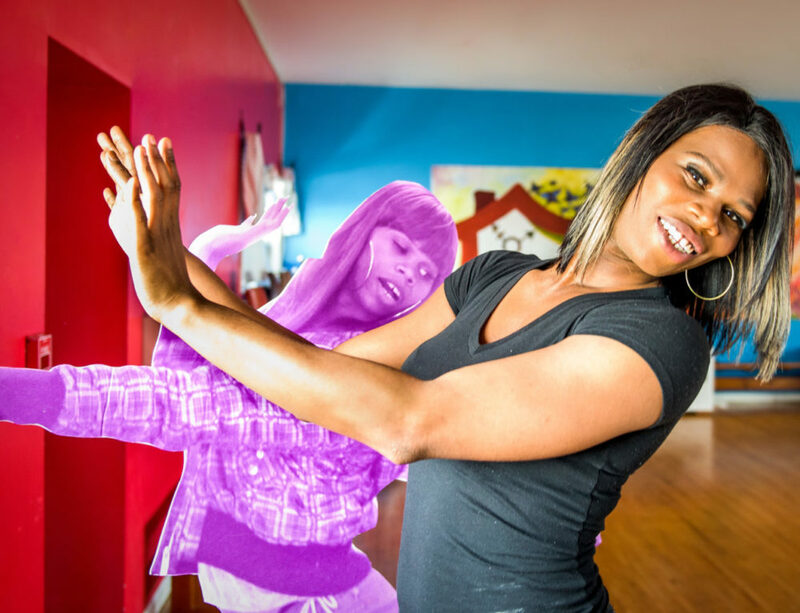 Before she opened up the 2016 Detroit Drag Review, host Sabin mentioned the victims saying that the morning has given the LGBT community a lot to think about. 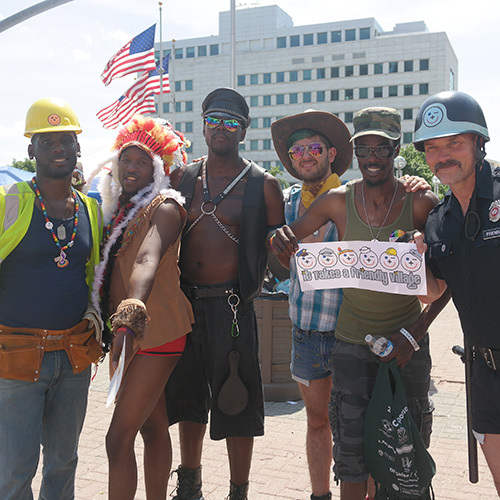 The Motor City Pride festival is a time for the LGBT community to celebrate who they are and to come together to be visible and stand together. And in standing be stronger. Moving forward – looking to tomorrow – we will be. 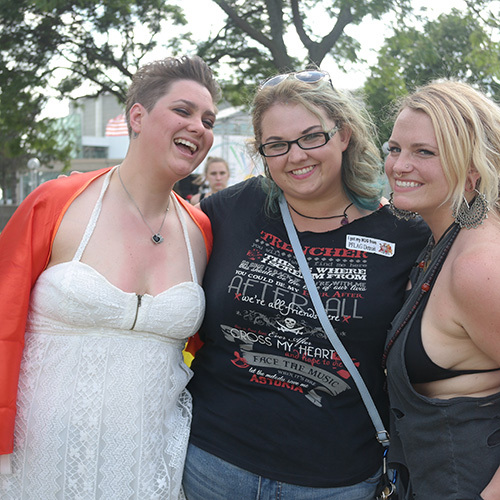 See more Pride Parade photos here. To see the vendor gallery click here. View a gallery of performances here.